I climbed Mt. 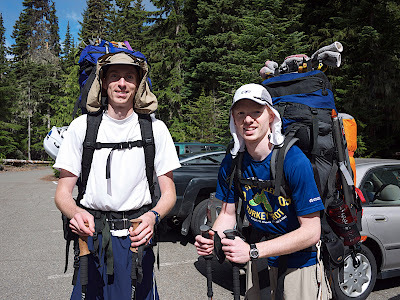 Rainier with my old roommate Erik this week. It was incredibly exhausting, but the mountain was spectacular. Friday: I flew to Seattle. Saturday: we got our gear together. Monday: we drove to Mt. 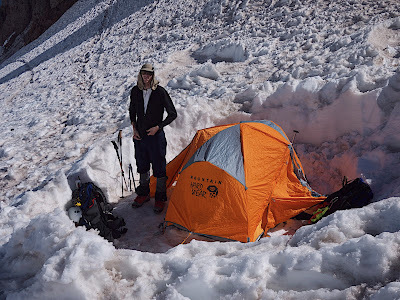 Rainier National Park and hiked to Camp Schurman. Erik's dad, a med student named Ana who's staying with their family, and Erik's and brother-in-law hiked with us to Glacier Basin. Tuesday: rest day, with some crevasse rescue practice. 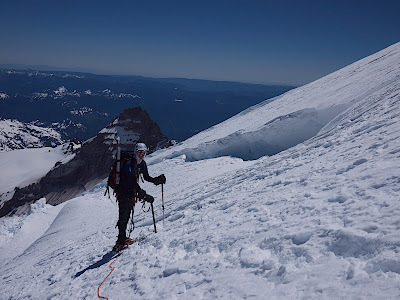 Wednesday: got up at midnight on Tuesday night/Wednesday morning to begin our summit climb via the Emmons-Winthrop route, which is the safer (but longer) of the two most popular routes up the mountain. Left camp at 2 a.m. after spending quite a while anchoring our tent so that the high winds wouldn't blow it away. Summitted a bit before 9 a.m., started back down around 9:30, and reached camp around 1:30 p.m.
Thursday: hiked out. Had a wonderful dinner on Lake Washington with Erik's family back in Bellevue. Pack weight (each): between 65 and 70 pounds. Total ascent from parking lot to summit: 10,400 feet (10,000 net)—almost two vertical miles. Base camp elevation: 9400 feet. Hummingbird sightings at base camp: 2. Bedtime on Tuesday night: 7 p.m.
Wakeup time on Wednesday morning: midnight. Hours of sleep I actually got the night before we summitted: 1/2. 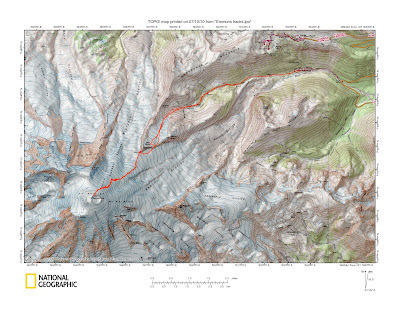 People who summitted via our route on Wednesday: about 25. Visible crevasses crossed on the way to the summit: 6 or 7. Beauty of the sunrise and sunsets: stunning. Freeze dried meals: lasagna with meat sauce, spaghetti, granola with fruit, chicken teriyaki (my favorite). Squares of toilet paper remaining between the two of us at the end of the trip: 4. Only place I got sunburned: the bottom of my nose. Bears seen: 1 (near Glacier Basin). Massage that Karren got me for my birthday after I got back: priceless! There are a few pictures below. You can see more in the gallery. In the parking lot at White River Campground, about to start our climb. 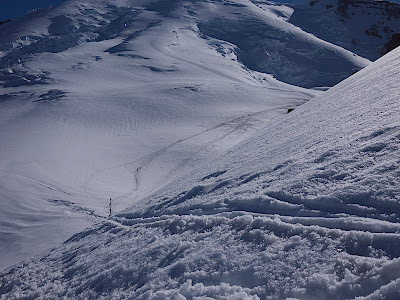 Partway up the Inter Glacier on Monday. 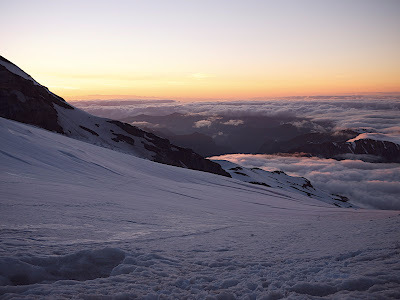 Traverse from the Inter Glacier to Camp Schurman. View from our tent on Monday night. Mt. 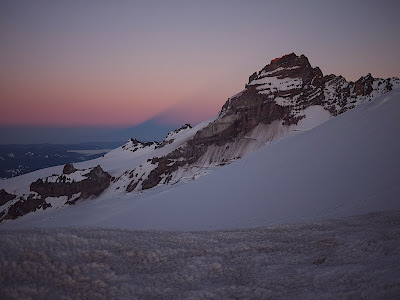 Rainier's shadow in the haze at sunset. Sunrise on Wednesday morning, from about 12,000 feet. Erik leading the way to the summit, next to a crevasse. Me and Erik on top. 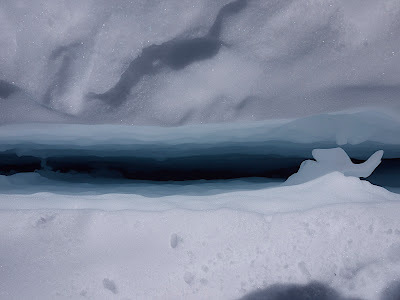 A little crevasse that we crossed (looking straight down). 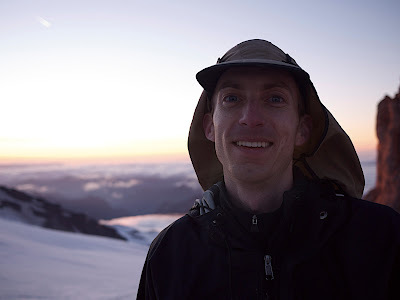 Me near a crevasse on the descent. 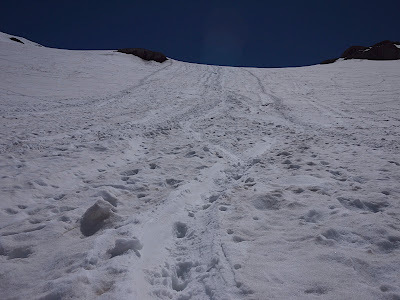 At the bottom of the Inter Glacier after a fun glissade. Back to the car on Thursday. It's about time you wrote in your blog again. Is that big puffy coat yours? I have to agree with Shanna about writing in your blog again. However, I know it's your coat. I love the picture with the shadow in the background. way to go Bruce! Still want to do that mountain. I saw it from the Seattle Harbor on the 4th. It's beautiful! Holy cow! That's impressive. And happy birthday, by the way. Shanna: not my puffy coat; I borrowed it from Erik's family. OK so maybe I DIDN'T know it was your coat. You have so many that I figured you wouldn't have to borrow one.